Discussion in 'Maiden Chat' started by Kalata, Mar 11, 2018. Well, I think in this thread, we can post Eddie pictures that are not official release and in general, everything about Eddie, including the official artworks too ! This was in very early stages of the artwork for the Virtual XI album. The working title at that time was: Virtual Insanity (pretty good title). This picture do not have the football pitch, but anyway, I think that the cover for the VXI album is a very cool piece of artwork ! fredo96993 Eddie dressed as a hill. Do you think maybe they purposefully toned down the gore a little, especially after the problems with The X Factor? Edit: nevermind, I hadn’t realised the rib cage and extended brain were on the final version. Pretty gruesome, I prfer the final version because it is darker and gives more meaning to the boy with the VR. I'm sorry, but what were the problems with The X Factor artwork ? I'm not familiar with that. Edit: nevermind, I hadn’t realised the rib cage and extended brain were on the final version. Pretty gruesome, I prfer the final version because it is darker and gives more meaning to the boy with the VR. I like both versions. The final version is more complete and I don't care if it was without the football pitch. This album cover is one of my favorites versions of Eddie - superb work from Melvyn Grant, who also done the FOTD album cover, which is my all time favorite cover and Eddie ! Why is Grant so obssessed with Eddie being green? Iirc TXF was originally a close up of Eddie on the table but it was deemed too graphic so they had to add a zoomed out cover to get some places to sell it. Speaking of Fear Of The Dark album, this is the Derek Riggs unfinished version for the album. I'm not surprised, the other used version is a masterpiece ! The 3 album covers that are done by Melvyn Grant (FOTD, VXI and TFF) are all very good ! This is the rejected artwork done by Derek Riggs for The Wicker Man single. Well, I see why it was rejected - the original version (that single has one more artwork with the band members on it) is way better ! Maiden used it as a backdrop for TWM in 2011. This is the poster that came along with the single for the Futureal song and was done by Derek Riggs, but for some reason didn't make the cover. Instead, they used the artwork with the copy SIT Eddie and it was in CG form - nothing can beat the drawing of a picture where the talent of the artist is shown in full - this is proven by Derek Riggs not once ! I've recently found a tour poster from the AMOLAD tour and for me it is better than the actual album cover ! One of the reasons is that Eddie is the main thing on the cover (the focus is on him), as it should be - not at the back of the cover ! Also, this poster has the tank on the background - good detail. But, for the actual album cover, I think the tank is done well - only Eddie should have been at the front of the cover and the skeleton soldiers to be at the back or around the tank - then it would be much better album cover. Guys, what are your thoughts about the tour poster artwork ? It's very nice, but I thought the actual cover looked more serious and less cartoony. That album wasn't meant to be too much fun. Only thing wrong with AMOLAD graphics is the rifle, the one whose barrel is 2 inch with a foot long ignition pin. I prefer the album cover we got, but that tour poster artwork would have been a great choice for live album cover (if they ever released one). Cool artwork anyway! Except that it wasn't a tour poster back in 2006. It's a fan made artwork maybe made around that time but it's not official. This is the poster that came along with the single for the Futureal song and was done by Derek Riggs, but for some reason didn't make the cover. Instead, they used the artwork with the copy SIT Eddie and it was in CG form - nothing can beat the drawing of picture where the talent of the artist is shown in full - this is proven by Derek Riggs not once ! It was supposed to be for the 7 inch picture disc, that was never released. 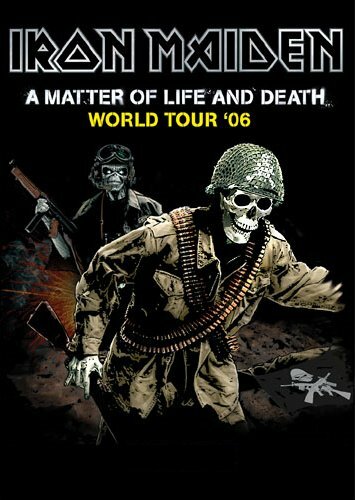 Maybe I was mistaken by the inscription: ''A Matter of Life and Death Europe tour 2006'' Anyway, this artwork is very awesome ! I like Grant’s VXI and loved FOTD, but I thought TFF was an abomination. I also loved his Eldorado sleeve, it would have served much better as the album cover. I’m also a fan of Marillion artist Mark Wilkinson who designed TBOS. However I will always stand by the notion Derek Riggs should be the only artist who paints Eddie. I dislike Rod Smallwood attitude towards him over the years, as if he’s just another artist who can be disposed of as they see fit. Although I acknowledge Derek wasn’t putting much effort into his Eddies from NPFTD onwards..
The_7th_one, desultory and soundwave like this.